The University of Hawai‘i at Hilo is proud of the role we play in educating students and supporting economic development on Hawai‘i island. We have the potential to do more, however, and since becoming chancellor last July, I’ve been asking community members to tell me their thoughts about how UH Hilo could increase its contributions to the island and state. The responses I’ve been hearing clearly show that the public expects UH Hilo to continue evolving, improving and extending its reach throughout the island in order to deliver a solid return on investment into the future. It’s fortunate therefore that UH Hilo’s strategic plan expires this year. UH Hilo has a timely opportunity to revisit our mission, re-envision our future, and perhaps adjust our course. We’ve begun a new round of strategic planning and hope to have a completed plan by May 2011. In the planning process, UH Hilo will take stock of our current situation and commit to our best guess for what our university could become and accomplish in the next five years. We will make sure our mission statement clearly conveys the unique benefits we offer to students and the community within the UH system, and we will publish clear goals toward which we can strive together. Last April, the university started its “pre-planning” initiative to gather information from faculty, staff and students to use in developing the plan. Their views were solicited through a survey and a “listening tour.” Results are being made available at the strategic planning website. We want to hear more from community members so that we can take into account your thoughts and opinions about UH Hilo. We would particularly value your feedback on what you think we currently do well, where you think we need to improve, and what our major priorities should be for the next five to ten years. You can provide input by visiting www.surveymonkey.com/listening, by emailing uhhplan@hawaii.edu, or by writing to Siân Millard, Strategic Planning Coordinator, University of Hawaii at Hilo, Hilo, HI 96720-4091. Work on developing the strategic plan begins this fall. We will ensure that the community has the opportunity to comment and provide feedback on the draft plan once it’s available. I very much look forward to hearing your views as we work together on this important initiative. One of the ways the University of Hawai‘i at Hilo meets the needs of Hawai‘i island is by preparing future members of the business community. More than ever, our fragile economy demands that knowledge of business practices and economics be widely distributed throughout the island. In addition, we need to prepare students for the workforce–not just for jobs (though these are critical) but also for careers. UH Hilo’s College of Business and Economics (CoBE) seeks to meet these needs through its programs of study and, by meeting the rigorous standards set by its accrediting association, the college can assure the public that its programs are of the highest quality. CoBE is able to document the high quality of its BBA programs through its maintenance of accreditation from the Association to Advance Collegiate Schools of Business International (AACSB International). The college earned initial accreditation in 2005. Within the state only UH Hilo and UH Mānoa’s Shidler College of Business have attained this internationally recognized accreditation. Accredited colleges undergo a lengthy process of self evaluation and extensive scrutiny, including onsite visits, by teams of experts. Some established business programs at other universities have had to struggle to achieve and maintain accreditation from AACSB International. This accreditation certifies that CoBE meets 21 rigorous standards assuring a challenging, up-to-date curriculum and a commitment to continuous improvement. Faculty must be active in their field and remain current in their knowledge. A degree from an AACSB-accredited school is widely recognized as excellent preparation for the workplace or graduate study. CoBE practices continuous improvement through assessment activities, which include measuring student progress in achieving learning goals and assessing student satisfaction. Assessment practices led CoBE to create an upper division, writing-intensive course to improve writing skills. Assessment also prompted CoBE to offer its College Fair, directly linking our students with community businesses and organizations for internship and job placement as well as career planning. CoBE offers majors in general management, accounting and economics. The general management program is UH Hilo’s largest major. The accounting major started in Fall 2008 and already has 60 student majors. Taken together, general management and accounting enroll approximately 10% of all UH Hilo undergraduates. For those who have already earned a bachelor’s degree in an area other than business, CoBE also offers a certificate program in business administration. Comprised of seven courses in such areas as accounting and marketing, the certificate provides a well balanced, up-to-date foundation of business knowledge. In addition, UH Hilo and Hawai‘i Community College have established a Degree Pathways Partnership, allowing students who began their business education at the community college to make a seamless transition to CoBE’s business administration program. CoBE also provides informal learning opportunities through its speaker series, which is free and open to the public. Speakers have included local entrepreneur Allan Ikawa of Big Island Candies on entrepreneurship, Darren Kimura on solar energy technology, and UH Mānoa Professor Emeritus Seiji Naya on income distribution and poverty alleviation for the Native Hawaiian community. Mayor Billy Kenoi will be the next speaker in the series September 16 at 3:30 pm in the Ho‘oulu Terrace (UCB 127). CoBE is discussing its future direction for growth and new programs. We plan to extend the bachelor of business administration degree to one or more sites on the island. There may also be potential to develop programmatically in partnership with UH Hilo’s College of Pharmacy. CoBE welcomes input from the business community about how best to meet future needs. In addition, the college is looking forward to moving into prime space on campus. Because a new building for the Division of Student Affairs will be constructed this year, CoBE will be able to move into the existing Student Services Building. Ever mindful of the need to use the learning environment to enhance students’ career skills, the college is making plans to assign space in the new building for students to work in groups and for state-of-the-art technology. Thank you. It is a pleasure to be here today. I’m really happy to be here in Hilo. Since July, I’ve been working with the faculty and staff at the university and interfacing with the community every chance I get. There is a lot of talent and expertise on campus and some great opportunities on this island and in the state. Part of the reason I took this job is because of the UH Hilo’s special role in access to higher education. Along with Hawai‘i Community College, we are the only source of higher education on this island. The island of Hawai’i is as big as the rest of the state combined, but there are eight UH campuses and several private colleges to meet their needs. We are responsible for taking students as they come—we are not selective in the way many other campuses are. But we graduate students who compete well for jobs with people who went to those selective schools. UH Hilo meets the needs of students who would not thrive at a big, urban university. We offer small classes, close contact with instructors, hands-on approach to learning. I was also intrigued because you can easily see and gauge the impact that this university has on the island’s economy and social life. In Los Angeles, we served 12 million people; our impact was invisible. Here, we can see where UH Hilo graduates work and what UH Hilo programs can do to build the economy of the island. We are accountable for our impact. Accountability is important. In this election season, it is easy to be reminded how accountable politicians are, and how closely we look at their accomplishments. Senator Daniel Inouye has been here today, I’m going to thank him personally for the impact he has had on UH Hilo students and our community. 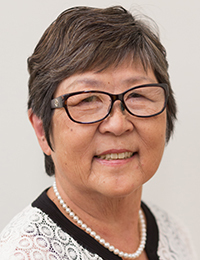 My predecessor, Rose Tseng, truly feels that his support and encouragement have been crucial to UH Hilo’s progress. The projects he supports are hands-on, problem solving, and results oriented—just the type of thing that UH Hilo can do well. We are sitting in one example of how Senator Inouye’s vision has helped us create a facility that benefits not just the campus, but the community and even visitors. In just a few short years, ‘Imiloa Astronomy Center of Hawai‘i has become an integral part of our community, embraced by Native Hawaiians and the astronomy community. ‘Imiloa now serves as a model for other science centers to show how science and culture may be integrated. When I look at the success its programs have, I am led to wonder what the next step is that we can take. There is often a tension between technology and culture. I think we can learn from ‘Imiloa’s success to learn how technology and culture can be mutually beneficial. Our College of Pharmacy is another important initiative championed by Senator Inouye. The college is already giving back to the community, especially through its leadership of the Hawaii County Beacon Community Consortium, which has so much potential to improve health care on our island. I hope our work can continue to benefit from the senator’s vision for the future of the state. Since taking up the chancellorship, I’ve been asking a series of questions wherever I go. I’m trying to integrate the answers that I hear into my sense of what future we might create with the UH Hilo. How does UH Hilo integrate into the island of Hawaii’s economic and cultural community? How does the island benefit from our campus being here? How do we tell students were graduate from Hawai‘i? What role do internships play? How can we serve the whole island? Special needs: rural health care? What is our role in food production/value added? What is our role in marine resources? Through our Office of Mauna Kea Management, we will implement the Comprehensive Management Plan for the Mauna Kea Science Reserve. We will earn the community’s trust that the natural and cultural resources will be protected, thus maintaining the conditions under which science on the mountain may develop and evolve into the future. How can we enhance the quality of education in a way that also enhances quality of life for the larger community? Graduation, help students learn. The longer they take to graduate, the longer it is before they earn, and contribute. In my years in administration, I’ve learned that it can be a creative activity when we develop and launch new academic programs or initiate projects–such as this science and technology park–to improve the local economy. It’s creative, but nothing is accomplished alone. We work with others–from the time a need is first identified. We then collaborate with others to fill that need. I’m fortunate that UH Hilo has a close relationship with business, the community and political leadership over the years. We have a history of productive cooperation that I’m eager to continue. As I go about meeting the faculty, staff and students at the University of Hawai‘i at Hilo and the community-at-large, I am often asked why I sought the Chancellor’s job when it meant leaving my position as Dean of Science at Cal Poly Pomona. My reply is, “why not?” Ask any number of my colleagues in the higher education community and they will tell you UH Hilo is positioned for a great future. One advantage this campus has over larger universities is its role and impact on the community it serves. At Cal Poly Pomona we had an enrollment of 20,000 students, serving 12 million people throughout the Los Angeles basin. With an area and population of that size, the university’s impact on the greater community is anybody’s guess. Here, with our enrollment of 4,000 students serving approximately 178,000 Big Island residents, the impact is much more obvious. The parents who enroll their children at UH Hilo, the businesses that hire our graduates and those who support us with their time and hard earned money can see first-hand how we meet the educational and economic needs of the community. Another aspect I found appealing is the university’s progressive outlook. UH Hilo’s desire to grow in spite of the current state of the economy is uncommon, yet wise from my point-of-view. We all recognize the need for belt tightening when you lack the money to do what you are used to. But belt tightening by itself is a recipe for remaining poor. At some point we must prepare to take advantage of an improving economy. We may not be able to do everything we’d like, but experience tells us that the first to recognize and seize an opportunity reaps the greatest benefits and sets the pace for those who follow. 1) How do we enhance student success? 2) How do we meet the educational needs of the entire island? 3) What are the priority directions UH Hilo should take? The answers to those questions will largely determine the university’s vision, its mission and what this campus will look like in five to ten years. We begin this process from a position of strength, as my findings have validated UH Hilo’s reputation as an inventive, well-run institution, moving in the right direction with very little that needs fixing. That is a testament to the vision and achievements of former Chancellor Rose Tseng, along with the faculty and staff who carried out that vision while maintaining high standards and developing practices that keep the university running well. I’m looking forward to helping shape the future of this fine university. As I move into my second month as University of Hawai‘i at Hilo chancellor, I’m discovering how many excellent programs and facilities this university has to offer. I’ve begun a series of visits with all the units of UH Hilo, and I’m finding much to be proud of. In this month’s column, I’d like to highlight one important UH Hilo off-campus facility: the North Hawai‘i Education and Research Center in Honoka‘a. Since May of 2006, NHERC has been meeting diverse community needs under the leadership of its entrepreneurial director, Farrah-Marie Gomes. NHERC’s mission is to provide access to college credit classes, lifelong learning opportunities, and a centralized, technology-rich meeting place for the North Hawai‘i community. The center grew out of a collaboration involving UH Hilo, Hawaii Community College, North Hawai‘i communities, and the Hawai‘i State legislature. The facility is fully equipped with up-to-date instructional technology, classrooms, large meeting spaces, and a computer lab. To increase access to higher education, college classes are offered at NHERC during the fall and spring semesters. Classes typically attract a mix of high school students and non-traditional adult learners, which leads to interesting discussions and unique learning experiences. Recently, online classes have been added to provide even more options for students. High school students regularly participate in credit classes through the Running Start program, which allows them to receive credits for both high school and college. NHERC also offers credit classes in Waimea at Kanu o ka ‘Aina. The number of non-traditional, adult learners has increased, partly because we are making evening classes available at sites closer to home. For many North Hawai‘i residents, the need to work full time and also meet family responsibilities hinders access to higher education opportunities in either Hilo or Kona. Local residents are now realizing that it may be possible to attain their higher education goals through NHERC. Students are able to access university support services from NHERC. The center’s Distance Learning Coordinator and Academic Support Specialist provide assistance to both prospective and current students. Additionally, NHERC provides support, including exam proctoring, to students working on online degrees and certificates offered by other UH system campuses. In the spirit of responsiveness, a scholarship fund was created to assist in meeting students’ financial needs with partial and full tuition scholarships. Over thirty scholarships have been awarded thus far. Lifelong learning classes are also provided to help people explore new activities and build new skills. Topics offered and class locations depend upon community demand. In addition to NHERC, classes have been given in Ka‘u, Pahoa, Waikoloa, and Kona. In some cases, when NHERC is unable to meet an identified need, NHERC has been able to find an entity willing to step in to fulfill that need for the community. The NHERC facility is still expanding. By January, construction should be completed for a number of additional rooms, an outdoor pavilion, and space for the new Heritage Center. The search process is also under way for a faculty member to serve as the Heritage Center Coordinator, with an estimated start date for this position of January 2011. UH Hilo is able to maintain a strong presence in North Hawai‘i through NHERC’s creative thinking and resourceful approach to challenges. The center’s staff also works closely with the community, most notably NHERC’s community advisory board, which helps guide the center’s development. By collaborating with the community in creative ways, NHERC’s talented and dedicated staff is able to provide opportunities for North Hawai‘i residents to pursue college education without leaving home.